Photo by European Parliament, via Flickr Creative Commons. With President Trump threatening to leave NAFTA unless the US gets what he determines to be a “better deal”, the future of free trade agreements around the world became dubious. This is why the Trudeau administration presents the Comprehensive Economic and Trade Agreement (CETA) with the European Union as the “blueprint for all ambitious, future trade deals.” The aim of this article is to present the main negative and positive elements of the agreement and use these to evaluate whether or not Canada should adopt this treaty. The main problem with CETA is the fact that it gives large companies power to sue governments in order to bypass certain legislation. However, despite this, the deal would largely benefit both the EU and Canada. Also, taking into consideration the current stage of negotiations, and the fact that a failure would make any future trade deal virtually impossible, the Canadian government should remain faithful to its ratification of the treaty. CETA is harmful to democracy because it gives a large amount of power to corporations and limits the capacity of states to impose regulations on them. The treaty does this by putting in place the Investor-State Dispute Settlement (ISDS) mechanism. The ISDS “grants corporations the special privilege to bypass domestic courts and to instead directly sue states at private international tribunals for compensation over health, environmental, financial and other domestic safeguards that they believe undermine their rights. These “private courts” are available only to foreign […] investors.” In order to qualify as a foreign investor, a company has to have “substantial business activities”. Consequently, this favors multinational corporations and undermines the interests of both Canada and Europe. For Europe, CETA will serve as a way for American companies like McDonald’s or ExxonMobil, which can qualify as foreign investors through their Canadian subsidiaries, to sue individual European countries because of their high environmental standards. For Canada, NAFTA serves as an example of what can happen under a process like the ISDS. Since its adoption, the Canadian government has been sued 35 times and has had to pay $171.5 million. However, the impact of these prosecutions is more important than the money they have cost . For example, in 1995, the Chrétien government tried to pass a temporary ban on the export of PBC because this chemical was causing pollution in many parts of the country, most notably the Great Lakes. However, the Ohio-based waste disposal firm SD Myers, which is about seventy kilometres from Erie Lake and could have thus contributed to the pollution of the Great Lakes, sued the Canadian government on the basis that “Canada’s motive behind the export ban was not concern for human and environmental health, but the protection of Canadian PCB remediation businesses which would not have been able to compete with its business model.” SD Myers won this case and the federal government had to compensate the company for $US6,05 million. This is not uniquely a economic setback, but also environmental and health-related. Due to the PCBs strong chemical stability, it is very hard to degrade. Consequently, it remains present in nature and within the organisms of the animals that consume it, even after their deaths. The spreading of PCB between ecosystems is thus very likely. If a human these animals, they would most likely die. Moreover, the International Agency for the Research on Cancer determined that PCBs may cause cancer. It follows that, unlike SD Myers’ claim, PCB does have a strong negative impact on environmental and human health. Since the provisions are very similar regarding the ISDS mechanisms in both NAFTA and CETA, similar cases like SD Myers vs Canada may happen in the future with European companies. While the negative impact of these policies is clear, there are also clear benefits to the treaty. Though CETA does favor large corporations, the fact of the matter is that it is also beneficial to the Canadian economy in general. It favors both Canadian and European economies by abolishing non-tariff barriers and by creating a system of taxation that favors trade between the two regions. A non-tariff barrier (NTB) is an “obstacle to international trade that is not an import or export duty […] [such as] import quotas, subsidies, customs delays, [etc. ]” The discrepancy in the provincial and federal trade laws is the main way NTBs are manifested in Canada, because it makes the conformity of the EU with Canadian rules impossible. The standardization of these regulations favors trade and economic development. The impact of NTBs can be measured by the Services Trade Restrictiveness Indicator. This indicator “gauge[s] [the] regulatory impediments […] [on] international trade and international investments.” In general, the more impediments there are, the less trade and investments there will be. Consequently, if there a country has a lower STRI than the other, then the former country should reduce the protection of its services. The following graph shows that Canada has a significantly higher STRI for seven sectors, has a relatively equal one for six, and the EU has a higher one for four. By the Office of the Parliamentary Budget Officer. This signifies that Canada should reduce the protection of its goods in order to facilitate trade. Regulations tend to impose costs on both domestic and foreign suppliers. Moreover, having fewer restrictions makes it easier to have similar trade laws for different markets. Consequently, reducing the protection of goods leads to an increase in exports, as shown in the following chart. Since the increase of exports results in the increase of GDP, then the reduction of non-tariff barriers in CETA is positive for the economic development of both Canada and the European Union. CETA also contains a modification of the bilateral tax system between the EU and Canada. This is because taxes have a great impact on “movement of money for the purpose of investment”, i.e. capital flows. For example, distinct tax systems may cause the duplication of taxation on businesses, which will incentivize companies to remain in their country of origin. This is why the Council for Canada Europe Trade recommended in 2005 a simplification of the bilateral tax code of the regions. Another modification is the application of the same corporate tax laws for foreign investors as for domestic businesses. The tax rate does vary depending on the profit of a corporation and also varies between the levels of government. However, the corporate tax rate is generally lower than the income tax rate. This is meaningful because foreign investors pay their corporate taxes based on the income tax rate, not the corporate tax rate. This unlevelled playing field thus reduces investments in Canada because the tax laws favor local companies to such a point that it is impossible for foreign investors to make any profit. For this reason, the CERT advised for the application of the same rules to both domestic and foreign businesses, which would increase capital flows.The elimination of these impediments to trade leads to the increase of the production of goods within the country, which will lead to an estimated $1.4G growth of the exports of Canada till 2022. In sum, CETA is economically beneficial to both Canada and the European Union; however, it also empowers corporations to escape important regulations, like environmental laws. Another important consideration is the global context to the adoption of this trade agreement. Considering the President Trump’s threats to terminate NAFTA and the Prime Minister May’s indication that the UK will leave the single market, a failure to ratify CETA would reveal a true decline in the western liberal-internationalist world order. In the face of leaders willing to abandon former institutions in favour of nationalist economic policies, CETA creates an economic and political interdependence that creates frameworks like the EU, the UN and NATO that are necessary to global peace. A better treaty is still technically possible, since CETA must still be ratified by the European Parliament and the national legislatures. There has been much turmoil in the EU, with protests in many countries. The francophone region of Belgium, Wallonia, even threatened to veto Belgium’s approval of the treaty, which would have made it impossible for the EU to ratify CETA. However, Wallonia ended up approving the trade deal and there are currently provisional measures before its official ratification. 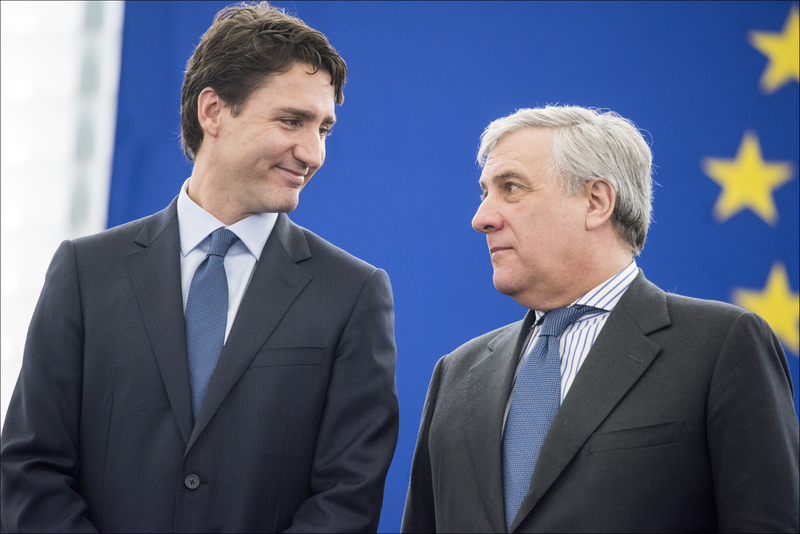 Wallonia’s experience proves that CETA is still vulnerable to rejection, and that further re-negotiation could threaten the deal’s adoption. The benefits of the deal outweigh the costs, and the time to act is now. For the good of the country, and for the future of bi- and multilateral trade deals, Canada should sign CETA and lead the way to liberalized trade.